A view from Kobe’s Tamon-dori onto Sankaku Koen (literally Triangle Park) in Hyogo-ku. 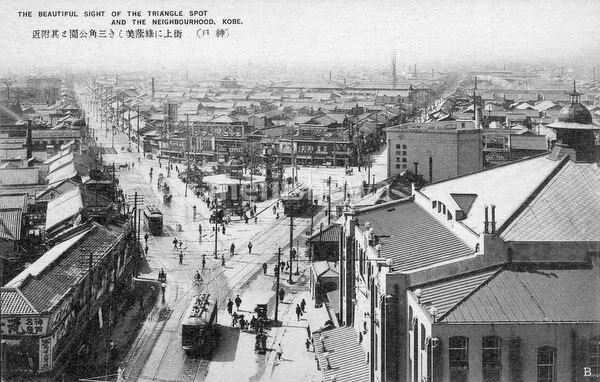 The road on the right is Daikai-dori, the one on the left Yanagihara-sen. It lead to Hyogo Station, and still does so, today. Behind the photographer’s back is Shinkaichi, until WWII, Kobe’s main commercial and entertainment center, famous for its many theaters. See blog entry.